Let’s review the 2018 Real Estate Market! Can you believe its almost February? We’ve hit the ground running in 2019, but I want to take a minute to review the 2018 real estate market with you. 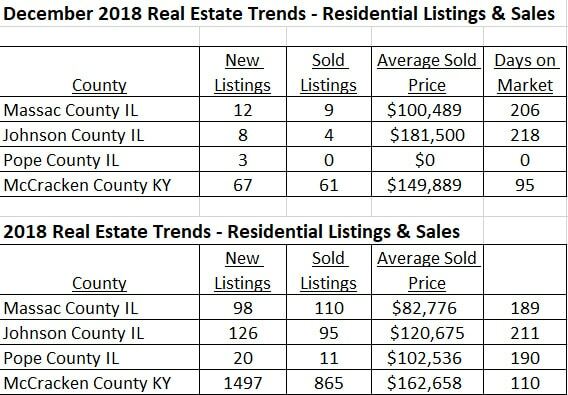 As you can see above, there were alot of homes sold in Southern Illinois and McCracken County KY in 2018. There were also many listed for sale in 2018. Personally, I like to see the number of sold listings exceed the number of new listings. This only occurred in Massac County in 2018. I also like to see a lower number of average days on the market. McCracken County has a hot real estate market. The average number of days on the market for a home in McCracken County is only 110 days. This is great! Massac County is just a little over 6 months, which isn’t bad. We typically sign 6 month listing agreements with clients when they list a house with us. The month of December was a pretty good month. Winter months are usually slow months for real estate. While we didn’t set any records, there was still a decent number that sold in December. The government shutdown has played a part in this. Any home buyer using Rural Development, HUD or VA mortgages to purchase a home has to wait to close their mortgage until the government shut down is over and the mortgages will be funded. The next couple months should be very busy for us. We currently have 20 listings in contingent status. This means there are accepted contracts between sellers and buyers but we are waiting on financing, home inspections, under writing, etc before the homes can be officially sold. 20 is alot for this time of the year. Have you checked out our website lately? We made some changes that recently went into effect. What I’m most excited about is that you can register on our website and save search parameters. When a new listing hits the market that meets your search parameters, you’ll receive an email with the details about the listing. Navigating around our website should be easier now as well. Let me know what you think of it! 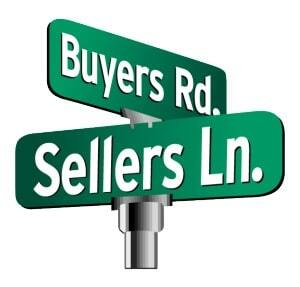 And if you’re interested in buying or selling property or just have questions, feel free to give us a call. (618) 524-3000.